Posted January 17, 2019 by Josette Farrell in News. There was widespread sadness as the news spread of the passing of Willie O’Connell of Knockdoe. 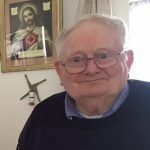 Willie was the tractor expert of the area over many years and if anyone had a problem with a tractor or machinery, Willie was called and nearly always solved the problem. Willie was the first in the area to bring the legendary Styer tractor to the area. The single cylinder tut tut was easily recognisable and people always knew it was Willie that was coming, when they heard the tractor sound. Life hadn’t come easily to Willie who was the oldest of four siblings as his father James died when he was just eight years of age. With his mother Delia and the young siblings they worked hard together in the family farm to try and make things meet. Over time Willie and the family overcame any obstacle that was there and he went on to become one of the first in the area to have a combine harvester, and provided a wonderful service to many farmers in the area. Willie was proud to see his son Michael build a successful tractor business and he always kept a huge interest in the changes that took place in tractors and machinery over the years. He loved the annual outing to the All-Ireland ploughing championships every year to enjoy the changes in the agricultural machinery section. In later years as his health declined, his family took wonderful care of Willie at his home and were warmly complimented for their efforts. His remains were taken from Sioraoicht to the Church of the Assumption and St. James, Claregalway. Following his funeral Mass where Fr. Ian O’Neill was joined by Fr. John O’Gorman, burial took place in Claregalway cemetery. Willie O’Connell is survived by his wife Kitty, sons James, Michael, Peter and William, daughters Anne and Catriona, daughters-in-law, grandchildren, brother Eamon, sister Sarah, brother-in-law, nephews, nieces, relatives, neighbours and friends. R.I.P. Willie O’Connell., Knockdoe, Claregalway. R.I.P. COLLINS, Willie, Waterdale, Claregalway.